ORLANDO, Fla. (AP) Tyler Johnson and Goran Dragic took over in the second half Saturday night, leading the Miami Heat back from an 18-point deficit in a 117-111 victory over the Orlando Magic. Johnson scored 22 points in the third quarter and Dragic had 14 in the fourth to help Miami avoid a second straight embarrassing defeat. Aaron Gordon scored 39 points for the Magic, who took a commanding lead with 24 fast-break points in a 66-point first half. Orlando got only two points off the break in the second half. The Magic (12-25) lost for the 10th time in 11 games despite shooting 54 percent. Just one night after a 24-point loss to Brooklyn, the Heat (19-17) shot 63 percent in the second half in winning for the eighth time in 12 games. Orlando led 68-50 early in the second half when Johnson led Miami back into the game. He made 10 of 11 shots including a couple of 3-pointers. 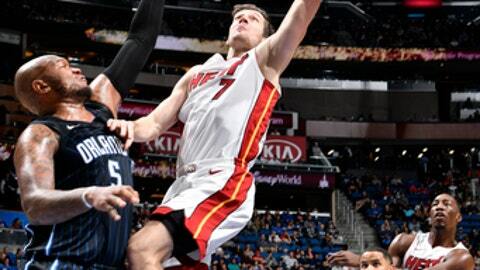 His only miss of the quarter was a long buzzer shot that left the Heat down 92-86. Heat: Johnson’s 22-point third quarter was a season high for Miami and only three points short of his personal season high for a game before Saturday night. Magic: Rookie F Jonathan Isaac will be placed in an injury rehabilitation and conditioning program and will be out indefinitely. Isaac has played only 36 minutes in three games since spraining his right ankle Nov. 11. Heat: Host Detroit on Wednesday night. Magic: At Brooklyn on Monday night.